4. an evaluation of the current impact of U.S. sanctions on U.S.-Cuban bilateral trade, investment, employment, and consumers, with particular attention to the effects on U.S. services, U.S. agriculture, and other sectors for which the impact is likely to be significant. The historical impact of U.S. sanctions with respect to Cuba on the U.S. and the Cuban economies is assessed for the time period from 1960 through the 1996 implementation of Cuban Liberty and Democratic Solidarity Act (CLDSA, also known as the Helms-Burton Act), as that act was the most recent change made to U.S. sanctions with respect to Cuba prior to the institution of this report. The current impact of U.S. sanctions on the U.S. and the Cuban economies is assessed for the time period after 1996. To assess this, the Commission analyzed the economic impact of what estimated U.S.- Cuban bilateral trade and investment flows might have been in the absence of U.S. sanctions. Baseline trade data used were Cuba’s average annual trade with the world during 1996-98, the most recent period for which such data were available. The Commission estimated expected U.S.-Cuban bilateral trade and foreign exchange flows in the absence of U.S. sanctions using data obtained from an analysis of the Cuban economy; fact finding travel in the United States and in Cuba by Commission staff; a public hearing on September 19-20, 2000, and written submissions from the public; an informal telephone survey of over 200 U.S. companies and associations; a review of the relevant economic literature; and an econometric analysis. The Commission has made no assumptions in this report regarding any possible future policy changes in Cuba. This report does not address trade in strictly military goods and services or trade in goods, services, and technology subject to export controls relating to U.S. national security interests—all areas not traditionally monitored by the Commission. U.S. economic sanctions with respect to Cuba had a minimal overall historical impact on the U.S. economy. Despite the relatively small size of its economy, Cuba was an important U.S. trade partner in the 1950s. U.S.-Cuban economic relations deteriorated significantly before comprehensive U.S. economic sanctions were implemented in reaction to political events in Cuba in the late 1950s. With most U.S. economic assets in Cuba expropriated by the Castro government during 1959-60, the U.S. economic sanctions of October 1960 and comprehensive sanctions of February 1962 appear to have caused few additional costs for the U.S. economy. Even with massive economic assistance from the Soviet Union during 1960-89, Cuba remained a small global market relative to other Latin American countries. The Cuban Government signed its first major trade agreement with the Soviet Union in 1960, and had seized almost all U.S. property in Cuba before comprehensive U.S. economic sanctions were imposed in 1962. Between 1960 and the late 1980s, Cuba’s relatively closed economy relied extensively on economic assistance from, and long-term economic agreements with, the Soviet bloc countries and China. The Commission estimates that U.S. exports to Cuba in the absence of sanctions, based on average 1996-98 trade data, would have been approximately $658 million to $1.0 billion annually; this is equivalent to about 17 to 27 percent of Cuba’s total imports from the world, or less than 0.5 percent of total U.S. exports (Table 1). This estimate would increase marginally, to $684 million to $1.2 billion, if U.S. exports were to increase by the amount of estimated additional net foreign exchange flows from the United States to Cuba from telecommunication services payments, travel and tourism payments, and U.S. foreign direct investment. Estimated U.S. imports from Cuba in the absence of sanctions, based on average 1996-98 trade data and excluding sugar (U.S. sugar imports are governmentregulated), would have been approximately $69 million to $146 million annually; this is equivalent to about 7 to 15 percent of total Cuban exports to the world, or less than 0.5 percent of total U.S. imports (Table 2). U.S. economic sanctions with respect to Cuba generally had a minimal overall historical impact on the Cuban economy. Cuba adjusted quickly to U.S. economic sanctions through political and economic the alliance with the Soviet bloc countries. Soviet economic assistance, which peaked at nearly $6 billion annually in the 1980s, largely offset any adverse effects of U.S. sanctions and enabled the Cuban economy to grow. The loss of Soviet economic assistance after 1990 caused a severe downturn in the Cuban economy, bringing to the forefront longstanding inefficiencies in the Cuban economy. The loss of Soviet assistance eventually forced Cuba to introduce economic reforms to attract foreign investment, and selective economic liberalization to stimulate domestic production. Despite the close geographic proximity that would appear to make the United States and Cuba natural trading partners, bilateral economic relations in the absence of sanctions could be limited for several reasons. For example, production constraints limit Cuba’s near-term export potential; foreign exchange constraints limit Cuba’s import purchasing power; and Cuba’s investment regime remains restrictive. Cuba also tends to select its trade and investment partners based on political considerations—the desire to maintain economic ties with existing partners and to avoid becoming economically dependent on a single country—rather than economic cost factors. Productivity constraints likely would limit Cuba’s near term ability to increase production of its main export products—Cuba would have to reduce sales to other countries in order to export to the United States. Similarly, Cuba’s lack of foreign exchange would mean that Cuban imports of U.S. goods most likely would displace imports of similar goods from other countries. The Cuban Government estimates that the cumulative cost of U.S. economic sanctions on the Cuban economy was $67 billion through 1998, including such costs as reduced trade and tourism, higher shipping costs, inability to procure spare parts, frozen bank accounts, foreign debt problems, and emigration of skilled workers. That estimate does not factor in the cumulative value of Soviet bloc economic assistance provided since 1960. Air transportation. U.S. economic sanctions had a small but measurable adverse historical impact on U.S. airline revenue and employment. Industry sources estimate that annual revenues from regularlyscheduled passenger service to Cuba in the absence of sanctions would account for no more than 1 percent of total passenger revenues of U.S. airlines. U.S. airports estimate that they would benefit from increased revenues if U.S. airlines were able to provide regularly- scheduled service to Cuba. Cuban Government officials reported that U.S. economic sanctions have resulted in higher costs for U.S.-manufactured aircraft components. Cuba has renovated its largest airports with the help of foreign investment; those airports probably would benefit from increased revenue and employment as a result of the operation of regularly scheduled flights to and from the United States in the absence of sanctions. Maritime transportation. Sanctions had an adverse historical impact on several U.S. sea ports. The port of New Orleans took nearly 10 years to replace the volume of cargo that it had shipped to Cuba. Florida ports, including the Port of Jacksonville and Port Everglades, also reported a similar adverse impact. U.S. ports, shipping lines, and cruise lines most probably would benefit in the absence of sanctions, and additional U.S. longshoremen jobs would be created. Cuban officials reported that U.S. sanctions, by restricting the operation of U.S.- and foreign-flag vessels with respect to Cuba, have increased Cuba’s shipping costs and deterred vessels of foreign shipping lines from docking in Cuban ports. Cuba’s ports and merchant fleet also would probably benefit from increased shipping in the absence of sanctions. Banking and insurance. Sanctions did not have a significant direct historical impact on U.S. financial services firms because Cuba had expropriated them before sanctions were imposed. Cuba is a small market for financial services, and U.S. financial services firms most probably would not make significant investments in Cuba in the absence of sanctions because of Cuban restrictions on foreign investment. Cuban banks and insurance firms are unlikely to be significantly affected in the absence of U.S. sanctions. Construction. The U.S. construction services industry participated in a wide range of infrastructure projects in Cuba prior to the imposition of sanctions. After sanctions were imposed, U.S. construction firms were replaced by Soviet and, more recently, Canadian and European firms. The historical impact of the sanctions on the U.S. industry was small, given the small size of the Cuban economy, limited business opportunities in Cuba, and alternative opportunities elsewhere in Latin America. U.S. industry sources report that their concerns about Cuba’s ability to finance major construction projects make it unlikely that the United States would become a significant exporter of such services to Cuba in the absence of sanctions. Telecommunications. The United States never completely severed telecommunications links with Cuba, and a small number of U.S. companies currently provide certain telecommunications services to Cuba. U.S. sanctions reportedly have had a large negative effect on the Cuban telecommunication industry, which functions with an antiquated and poorly maintained domestic infrastructure. U.S. telecommunications providers most probably would attempt to increase their participation in the Cuban market if U.S. sanctions were removed, although market opportunities may be limited because telecommunications providers of other countries already have made significant inroads in the Cuban market. A Cuban- Italian joint venture company has a 12-year exclusive agreement to provide basic telecommunication services in Cuba. Another Cuban joint venture company with Canadian investors has a 20-year exclusive agreement to provide analog and digital cellular service to Cuba. Tourism. Sanctions had a minimal direct historical impact on the U.S. tourism industry because U.S. properties were expropriated before sanctions were imposed and Cuba’s tourism sector suffered due to a declining number of U.S. visitors in the late 1950s. Cuba gave a low priority to the tourism sector between 1960 and the early 1980s. Since the late 1980s, however, the Cuban Government has targeted tourism as a priority sector for its ability to generate foreign exchange. U.S. sanctions prevent U.S. investors from participating in the joint venture arrangements Cuba has awarded to European, Canadian, and Caribbean partners. U.S. industry sources estimate that 1 million U.S. tourists annually could visit Cuba in the absence of sanctions, which could benefit U.S. tourism service providers if they are able to enter the Cuban market. Meat and dairy. Sanctions had a small historical impact on the U.S. livestock and dairy sectors. It is estimated that U.S. exports of beef, pork, and poultry to Cuba in the absence of sanctions would have totaled $62 million to $76 million annually (or 1 percent of total U.S. meat exports), based on average 1996-98 trade data. In addition, estimated U.S. exports of dairy products to Cuba, in the absence of sanctions, would have totaled $4 million to $12 million annually (or 1 to 3 percent of total U.S. dairy exports). Sanctions had a small historical impact on Cuba’s meat and dairy sectors because Cuba was able to find other suppliers, but at somewhat higher prices. Cuban production is not competitive internationally, and would make only small gains in the absence of sanctions. Wheat. Prior to the imposition of sanctions, the United States supplied most Cuban wheat imports. However, owing to the small share of U.S. exports going to Cuba and the ability of U.S. exporters to find alternative markets, the overall historical impact of sanctions on the U.S. wheat industry was small. In the absence of sanctions, U.S. exporters would be able to take market share away from current suppliers to the Cuban market (e.g., France, Argentina, and Canada), and thus the current impact of sanctions on the U.S. wheat industry is fairly significant. It is estimated that U.S. wheat exports to Cuba in the absence of sanctions would total $34 million to $52 million annually, representing 40 to 60 percent of Cuban wheat imports in the short term. This change would increase U.S. exports by 1 percent of the value of 1996-98 U.S. wheat exports. Rice. During 1955-58, Cuba was the leading market for U.S. rice exports (purchasing about 25 percent of U.S. rice exports). Thus, historically the loss of the Cuban market had a significant impact on the U.S. rice industry, although over time U.S. exporters were able to ship to other countries, but frequently only with official U.S. export assistance. The current impact of sanctions on the U.S. rice industry is significant, indicating that U.S. exporters would be highly competitive with current suppliers (Thailand, China, and Vietnam) to the Cuban market in the absence of sanctions. In the absence of sanctions, it is estimated that U.S. exports of rice to Cuba would total $40 million to $59 million annually, based on average 1996-98 trade data, representing 40 to 60 percent of Cuban rice imports in the short term, mostly at the expense of Thailand. This change would increase exports by 4 to 6 percent of the value of 1996-98 U.S. rice exports. Feedgrains. U.S. sanctions had a minimal effect on U.S. feedgrain production and export levels and posed few problems for the U.S. corn and feedgrain industry. Prior to the implementation of U.S. economic sanctions, Cuba’s grain-fed livestock sector was rather small, and the United States supplied Cuba with negligible amounts of corn and feed grain. In the absence of sanctions, the U.S. feedgrain industry is likely to be highly competitive in the Cuban market, particularly in corn and sorghum. In the absence of sanctions, it is estimated, based on 1996-98 annual average trade data, that U.S. exports of feedgrain to Cuba would total $9 million to $10 million annually (less than 0.5 percent of total U.S. feedgrain exports), representing 90 to 100 percent of Cuban feedgrain imports. Animal feed. Although Cuba was a leading market for certain U.S. feed exports, the historical impact of sanctions on the U.S. animal feed industry has been small. Since the imposition of sanctions, the United States found other markets for animal feed, particularly Japan, Canada, and the European Union (EU). The current impact of sanctions is to deny U.S. exporters access to a growing Cuban market for animal feed ingredients (particularly vegetable meals and oilseed meals) that resulted from the significant expansion in the Cuban hog sector. In the absence of sanctions, it is estimated that U.S. exports of animal feed to Cuba would total $42 million to $48 million annually (or 1 percent of total U.S. animal feed exports), based on average 1996-98 trade data, representing 80 to 90 percent of Cuban animal feed imports. Fats and oils. Prior to the sanctions, the United States supplied most Cuban imports of fats and oils. Thus the historical impact of sanctions was significant initially for the U.S. fats and oils industry, particularly for the animal fats industry. However, over time U.S. exporters were able to find alternative markets. In the absence of sanctions, the U.S. fats and oils industry stands to export lard, tallow, and vegetable oil to Cuba, taking a substantial share of Cuban imports away from competing countries such as Argentina and Brazil. In the absence of sanctions, it is estimated that U.S. exports of fats and oils to Cuba would total $29 million to $33 million annually (or 1 percent of total U.S. fats and oils exports), representing 80 to 90 percent of Cuban fats and oils imports. Dry beans. Overall the historical impact of sanctions on the U.S. dry bean industry has been small. Although the loss of the Cuban market initially posed a significant problem for the industry, over time exporters were able to ship to other countries. In the absence of sanctions, the U.S. dry bean industry would probably export black beans, pinto beans, and white beans to Cuba, reducing market share of Canada, China, and Australia. It is estimated that U.S. exports of dry beans to Cuba in the absence of sanctions would total $13 million to $26 million annually (or 4 to 8 percent of total U.S. dry bean exports), or approximately 20 to 40 percent of Cuban dry bean imports. Cotton. Sanctions had a small overall historical impact on U.S. cotton production and exports. Close geographic proximity makes U.S. cotton producers natural suppliers for the Cuban market, and U.S. producers could satisfy all of Cuba’s cotton demand without difficulty. Sanctions prevented U.S. cotton exports to Cuba as the Cuban textile and clothing industries expanded in the 1960s through the 1980s. It is estimated that U.S. exports of cotton to Cuba in the absence of sanctions would have been $6 million to $8 million annually (less than 0.5 percent of total U.S. cotton exports), based on average 1996-98 trade data, or approximately 50 to 70 percent of Cuban cotton imports. Winter vegetables. U.S. sanctions initially benefited the U.S. winter vegetables industry, which is concentrated in Florida. That benefit dissipated over time, however, as imports from Mexico and other countries increased. The U.S. industry most probably would receive a small benefit in the absence of sanctions, as Cuba probably would import fresh vegetables from the United States to supply its growing tourism sector (valued at $250,000 to $500,000 annually, or less than 0.5 percent of total U.S. winter vegetable exports). 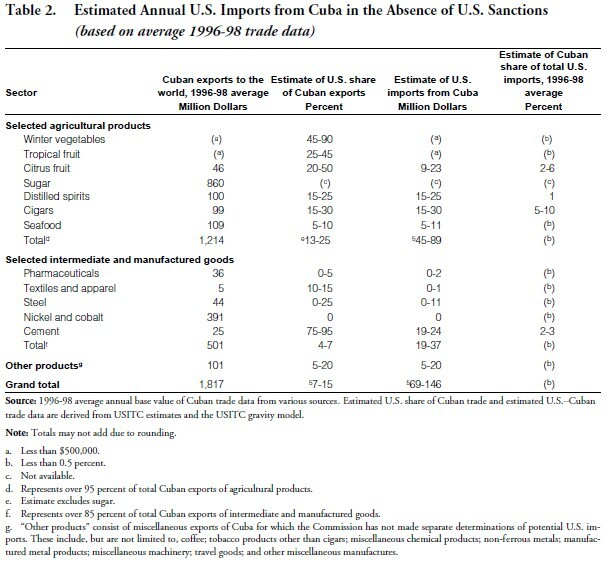 Sanctions had little historical impact on Cuban production and consumption of winter vegetables. Cuban production could increase as a result of U.S. investment and access to U.S. technology in the absence of sanctions. Current Cuban output and export potential is constrained by a lack of foreign exchange to obtain inputs such as fertilizer and pesticides. In the longer term the U.S. industry most probably would be adversely affected in the absence of sanctions as Cuba becomes better positioned to take full advantage of its available land and lowcost labor. It is estimated that U.S. imports of fresh winter vegetables from Cuba would total $30,000 to $60,000 annually in the short term in the absence of sanctions, based on average 1996-98 trade data (less than 0.5 percent of total U.S. imports of winter vegetables). Tropical fruit. The United States was Cuba’s primary export market for tropical fruits in the 1950s. Sanctions generally had a positive historical impact on the U.S. economy as growers who immigrated from Cuba during the early 1960s set up operations in southern Florida, effectively establishing the U.S. industry. Sanctions had a minimal historical impact on Cuba, which shifted exports to the Soviet Union. Current Cuban output and export potential is constrained by a lack of foreign exchange for inputs such as fertilizer and pesticides. The United States most probably would benefit in the absence of sanctions, as Cuba probably would import U.S. tropical fruit to supply its tourism sector, valued at $40,000 to $72,000 annually (less than 0.5 percent of total U.S. tropical fruit exports). However, in the longer run the U.S. industry probably would be adversely affected in the absence of sanctions as Cuba becomes better positioned to take fuller advantage of its resource endowments with respect to available land and lowcost labor. It is estimated that U.S. imports of tropical fruit from Cuba would total $90,000 to $180,000 annually in the short term in the absence of sanctions, based on average 1996-98 trade data (less than 0.5 percent of total U.S. tropical fruit imports). Citrus fruit. Cuba is an important grower and exporter of citrus products. Sanctions reportedly benefited the U.S. citrus industry by restricting competition from Cuban citrus—mainly fresh grapefruit, orange juice, grapefruit juice, and limes. U.S. consumers and the U.S. citrus industry probably would be affected in the absence of U.S. sanctions with respect to Cuba. It is likely that Florida grapefruit producers would face the potential of an influx of Cuban grapefruits several weeks prior to the start of the Florida season, which would probably lead to lower U.S. prices. The full impact for fresh citrus would take several years to develop because Cuban fruit would have to meet strict U.S. phytosanitary standards, and the Cuban industry would need investment capital and time to reach its full potential. Several foreign investors already are working to expand Cuba’s citrus export industry. It is estimated that U.S. imports of citrus fruit from Cuba would total between $9 million and $23 million annually in the absence of sanctions (or 2 to 6 percent of total U.S. imports of citrus fruit), based on average 1996-98 trade data. Sugar. Sugar is Cuba’s most important agricultural export. In 1959, Cuba exported 2.9 million metric tons of sugar to the United States, received 72 percent of the U.S. import quota for sugar, and supplied 35 percent of the total U.S. sugar imports. The historical impact of the U.S. sanctions was minimal because both the United States and Cuba adjusted quickly—the United States allocated Cuba’s sugar quota to other Latin American and Caribbean countries, while Cuba sold the bulk of its sugar to the Soviet bloc countries. In the absence of sanctions, Cuba’s status with respect to the U.S. sugar program would be uncertain. If Cuba were included in the current tariff-rate quota (TRQ) regime, Cuba’s access is not likely to be on the scale to which Cuba was accustomed before the sanctions. If Cuba were not included in the current TRQ regime, Cuban sugar exports to the United States would be zero and would therefore have no impact on the U.S. sugar industry. As with sugar from any other non-quota holding country, Cuban sugar would be dutiable at the over-quota tariff rate for raw sugar of 242 percent ad valorem equivalent, which given current world market prices is prohibitive. Distilled spirits. Cuba was the second largest supplier of rum to the United States after Jamaica prior to the imposition of U.S. sanctions. After sanctions were imposed, shipments from Jamaica and other sources quickly increased to offset the loss of Cuban shipments. The historical impact of sanctions on U.S. consumers was small in terms of availability of supply and prices. U.S. economic sanctions had a severe adverse impact on the Cuban distilled spirits industry. Sanctions caused Cuba to lose its largest rum export market, exacerbating other problems in the Cuban industry caused by the emigration of several Cuban company owners after the Castro government came to power that left a void in marketing knowledge, technical expertise, and capital in Cuba. It is estimated that U.S. imports of distilled spirits from Cuba would total $15 million to $25 million annually (or 1 percent of total U.S. imports of distilled spirits) in the absence of sanctions, based on average 1996-98 trade data. Cigars. Prior to the imposition of sanctions, Cuba was nearly the exclusive foreign supplier of cigar tobacco. Sanctions forced the U.S. industry into a major and costly restructuring program, and U.S. cigar companies were forced to develop alternative supply sources. The historical impact on the Cuban industry was small as Cuba was able to find alternative markets, principally in Europe. It is estimated that U.S. imports of cigars from Cuba in the absence of sanctions could total $15 million to $30 million annually (or 5 to 10 percent of total U.S. imports of cigars), based on average 1996-98 trade data. Seafood. Sanctions caused no measurable effects on U.S. seafood exporters because Cuba was a small U.S. seafood trading partner. Sanctions had a significant negative impact on U.S. demand for Cuban seafood exports. The loss of the U.S. market forced Cuba to find new export markets such as Spain, France, and Japan which, because of their distance, raised Cuban transportation costs. It is estimated that U.S. seafood exports to Cuba in the absence of sanctions would total $1 million to $2 million annually (less than 0.5 percent of total U.S. exports of seafood), based on average 1996-98 trade data, most of which would be destined for Cuba’s tourism sector. U.S. imports of Cuban seafood would total $5 million to $11 million annually (less than 0.5 percent of total U.S. seafood imports), increasing competition primarily for the Florida fish industry. Fertilizers and pesticides. The historical impact of sanctions was small because, although Cuba was a small but important outlet for U.S. fertilizers and pesticide products at the time sanctions were imposed, U.S. exporters were able to find alternative markets for their products relatively quickly. The current impact of sanctions on the U.S. fertilizer and pesticide industries is small but measurable. It is estimated that the U.S. fertilizer exports to Cuba in the absence of sanctions would total $8 million to $15 million annually (less than 0.5 percent of total U.S. fertilizer exports), or 10 to 20 percent of Cuba’s total imports. 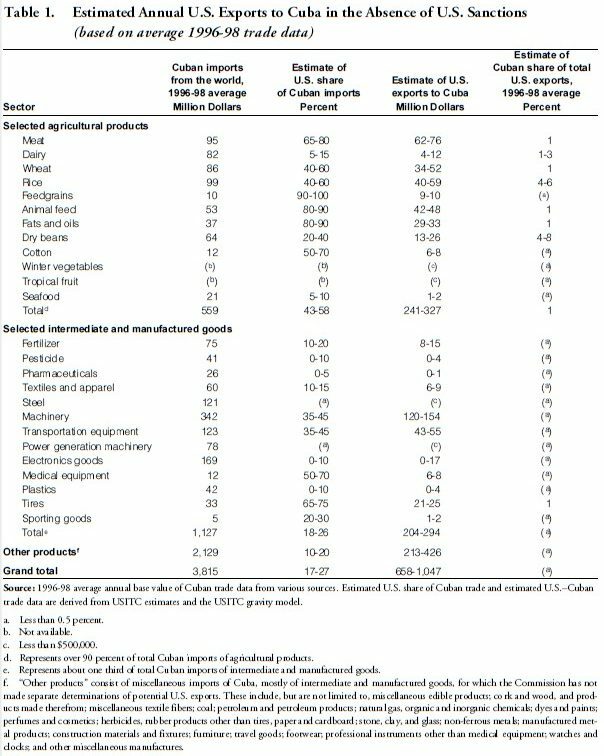 If Cuban agricultural production were to increase, Cuban demand for pesticide products, including imports from U.S. companies, probably would increase. In the absence of sanctions, U.S. exports of pesticide products would be small, at most $4 million in the short term. Pharmaceuticals. Sanctions had a minimal historical impact on the U.S. pharmaceuticals industry given the small size of the Cuban market and access to alternative suppliers. In the absence of sanctions, U.S. pharmaceutical exports would probably be small (zero to $1 million). Onerous licensing restrictions and health and safety regulations of the Cuban government most probably would impede some U.S. exports. Although Cuba had access to pharmaceutical products from other countries, U.S. sanctions provided an impetus for Cuba to develop an indigenous biotechnology industry. Textiles and apparel. Sanctions generally had a minimal historical impact on the U.S. textiles and apparel industry, which found alternate markets for their products. It is estimated that U.S. exports of textiles and apparel to Cuba in the absence of sanctions would total $6 million to $9 million annually (less than 0.5 percent of total U.S. textile and apparel exports) in the absence of sanctions, based on average 1996-98 trade data. U.S. companies reportedly might consider establishing sewing operations in Cuba because of its proximity to the United States, skilled and educated workforce, and low labor wage rates. Sanctions initially impeded the operations of the Cuban textiles and apparel industry by eliminating a key source of raw and intermediate materials and machinery. The Cuban industry was aided by Soviet assistance through the 1980s; however, Cuban textile production has declined substantially since the loss of Soviet assistance. Steel. The historical impact of sanctions on the U.S. steel industry was small, as U.S. producers quickly found alternate markets for their products. In the absence of sanctions, U.S. exports of steel products to Cuba most probably would be small. Sanctions had little, if any, impact on Cuba because steel is readily available on world markets. Cuba has developed a small steel industry with a product line limited to commodity-type long products, primarily concrete reinforcing bar, and exports about 60 percent to 80 percent of its production, primarily to the Caribbean and Central America. In the absence of sanctions, it is estimated that U.S. imports of steel products from Cuba would total no more than about $11 million annually (less than 0.5 percent of total U.S. imports of steel). Nickel and cobalt. The United States produces no primary nickel and cobalt, while Cuba is one of the world’s major nickel and cobalt regions in terms of proven reserves. The historical impact of sanctions has been higher prices paid by U.S. consumers who must purchase nickel-containing products, such as stainless steel and nickel alloy products, from more distant suppliers such as Norway, Australia, and Russia, and cobalt products from Norway, Finland, Zambia, and Congo. Sanctions prohibit U.S. imports of Cuban-origin nickel from countries such as Canada that process it. In the absence of sanctions, it is likely that the United States would import Cubanorigin nickel and cobalt products from Canada (valued at between $55 million and $71 million annually). Machinery and transportation equipment. The historical impact of sanctions on U.S. industries was minimal, as alternate markets were easily located. It is estimated that U.S. exports of machinery in the absence of sanctions would total $120 million to $154 million annually (less than 0.5 percent of total U.S. machinery exports), based on average 1996-98 trade data. U.S. exports of U.S. transportation equipment would probably total $43 million to $55 million annually (less than 0.5 percent of total U.S. transportation equipment exports). The historical impact of sanctions on Cuba was significant, particularly during the 1960s, as Cuba was denied access to U.S. spare and replacement parts. Cuba eventually replaced and added machinery and transportation equipment, first from the Soviet bloc countries and later from Europe and Japan. Power generation machinery. Sanctions had a minimal historical impact on U.S. producers, who were able to find alternate markets for their products. In the absence of U.S. sanctions, exports of U.S.-made power generation machinery most likely would be small because of U.S. industry concerns about the Cuban regulatory environment. The historical impact of sanctions on Cuba was minimal, as the Soviet bloc countries provided Cuba with subsidized oil and technical and financial assistance. Most of Cuba’s power generation capability relies on old, inefficient facilities in need of upgrading, and a small number of joint venture projects with foreign investors are underway. However, the current Cuban regulatory environment would remain an obstacle to significant U.S. participation even in the absence of U.S. sanctions. Electronics goods. Sanctions had little historical impact on U.S. electronics goods companies because Cuba was a small market and alternative customers were quickly located. It is estimated that U.S. exports of electronics goods to Cuba in the absence of sanctions would be less than $20 million annually (less than 0.5 percent of total U.S. electronics goods exports), based on average 1996-98 trade data. Sanctions prevented Cuba from purchasing equipment compatible with U.S. equipment installed prior to 1960, and have limited Cuba’s access to the latest technologies. This has been a significant problem in the area of telecommunications equipment. Cuba has developed limited production capabilities that would pose no competitive threat to U.S. firms in the absence of sanctions. Medical equipment. The historical impact of sanctions on U.S. sales and employment was minimal because Cuba was a small market for U.S. medical goods. Some U.S. firms that already export to Latin American countries report that they would probably export small amounts to Cuba in the absence of sanctions. It is estimated that U.S. exports of medical equipment to Cuba in the absence of sanctions would total $6 million to $8 million annually (less than 0.5 percent of total U.S. medical equipment exports), based on average 1996-98 trade data. Sanctions generally had a small impact on Cuba, which was forced to obtain medical equipment from the Soviet bloc countries, Europe, and Asia, although Cuba may have faced higher prices and a less competitive marketplace without access to U.S. products. Cement. Sanctions limited U.S. access to nearby cement supplies, and forced U.S. consumers to pay somewhat higher prices as imports were obtained from more distant suppliers in Europe and Asia. Sanctions had no measurable historical impact on Cuba. In the absence of sanctions, it is estimated that 75 to 95 percent of Cuban cement exports would be directed to the U.S. market, equivalent to $19 million to $24 million annually (or 2 to 3 percent of total U.S. cement imports), based on average 1996-98 trade data. Given the high transportation costs associated with cement trade, most of the impacts would be felt in U.S. southern states. Plastics. Sanctions had a minimal impact on the U.S. plastics industry. It is estimated that the U.S. plastics industry could supply as much as 10 percent of Cuban imports in the absence of sanctions, equivalent to about $4 million annually (less than 0.5 percent of total U.S. plastics exports) based on average 1996-98 trade data. Although there was a small plastics industry in Cuba prior to 1958, the development of that industry continues to be impeded by Cuba’s lack of access to modern technologies and limited access to chemical feedstocks derived from petroleum. Tires. Sanctions had a small impact on the U.S. tire industry as manufacturers were able to find alternative markets for their products in Latin America and Asia. It is estimated that U.S. exports of tires to Cuba in the absence of sanctions would total $21 million to $25 million annually (or 1 percent of total U.S. tire exports), based on average 1996-98 trade data. Sanctions had a small historical impact on Cuba and do not appear to have significantly affected the Cuban tire industry. Sporting goods. Sanctions had no measurable impact on the U.S. sporting goods industry. Sanctions denied potential Cuban customers access to high quality U.S.-made sporting goods, forcing Cuba to import certain types of high-end sporting goods from Europe. It is estimated that U.S. exports of high-end, premium quality sporting goods (for top-level Cuban athletic teams, particularly those involved in international competition) would probably total $1 million to $2 million annually in the absence of sanctions (less than 0.5 percent of total U.S. sporting goods exports), based on average 1996-98 trade data. Cuban sporting goods would not likely be competitive in the U.S. market without significant foreign investment. 1. This paper is the executive summary for the United States International Trade Commission (USITC) study, The Economic Impact of U.S. Sanctions with Respect to Cuba, USITC Publication 3398, Investigation No. 332-413, February 2001. The entire report can be found on the USITC website at ftp://ftp.usitc.gov/pub/reports/studies/pub3398.pdf. The report was undertaken by a team of economists and industry analysts at the Commission. Jonathan R. Coleman was a project leader for the study and presented the paper at the ASCE meeting.